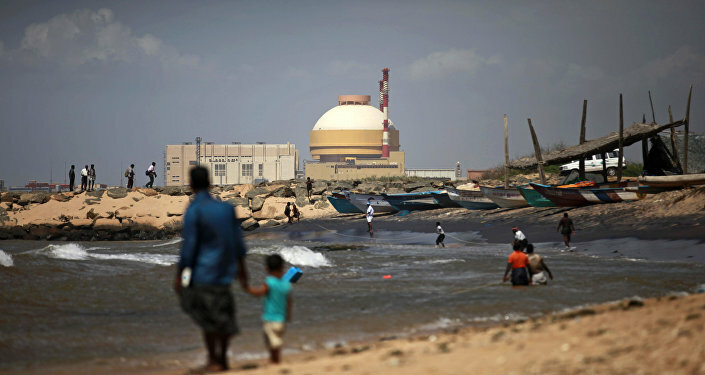 New Delhi (Sputnik): The Narendra Modi-led government has announced that domestic private firms will be given a major share in all upcoming nuclear power plant projects in the country, thereby increasing the share of nationally made content in the nuclear reactors. The government has already started outsourcing a major chunk of work to the private sector in two major projects — the pressurized heavy water reactor (PHWR) and light water reactor projects. In the PHWR project, the private sector has been tasked with providing plant components, equipment, services in areas including construction, fabrication, and erection of equipment, piping, electrical, instrumentation, and consultancy, auxiliary and logistical services. "In respect of Light Water Reactors (LWR) (2000 MW) set up with foreign cooperation, the Indian private sector is involved in the supply of some of the equipment and in the execution of works contracts. The indigenous content in LWRs is planned to be increased progressively," Jitendra Singh, the junior minister in the department of atomic energy informed the Parliament on Wednesday. India's two fully operational nuclear power plant units at the Kudankulum have 20% local content. The overall indigenization of the power plant is expected to cross 50% with the commissioning of the fifth and the sixth units. Currently, the third and fourth units are being constructed at a cost of approximately $6 billion, while the $7.5 billion have been sanctioned for the fifth and sixth units. However, the government has made it clear that the private sector will not be allowed directly in the nuclear power generation business. "There is no proposal under consideration at present, to permit private sector in the area of nuclear power generation," Minister Jitendra Singh added. The clarification comes against the backdrop of arguments from various sectors that private enterprises should be allowed to participate in the business of nuclear power generation as the state-owned NPCIL lacks capital, which inhibits the growth potential the sector deserves.